Today I am going to introduce you guys to a very new brand called “Osperi” established in 2016. There are so many unique things about this brand and their site. I will talk about it one by one. I am going to review two of their products in this post and I hope at the end you are going to find this helpful ? Let me start with a small introduction about Osperi. 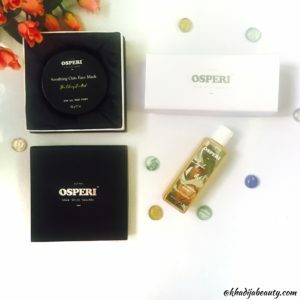 Osperi offers premium handcrafted Skincare and haircare products that are formulated with Ayurvedic and Unani wisdom. All of their products are free from preservatives and parabens. At Osperi we are creating healthier lives through natural remedies, healthy living ideas and DIY Beauty products. We believe one size does not fit all. Beautiful Skin requires choosing beauty treatments formulated for the unique needs of your Skin. What’s unique and attractive about Osperi? So this is one site where you can find everything about your skin and hair. They have an option where you can customize your own cosmetics. This customization part is really a new thing and only a few brand in India does this. But what if I tell there is another very new and completely unique thing about this brand? Yes, the thing which impressed me a lot and I guess no other brand has it in India, is that when you visit their site there will be an option to take up a quiz. And through this quiz you can find out your exact skin type/ hair type. To my surprise there are actually 9 different skin types based on different issues that your skin has. 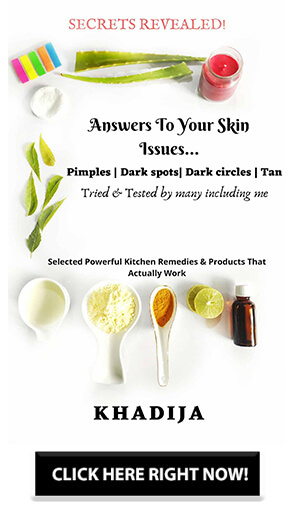 By the end of the quiz, you will not only find what’s your skin type but the site will also recommend a whole skincare regimen focusing on your skin problems. So basically this site is dermat?I was completely blown off with this concept and if you too find it different and new then do let me know in the comments below. So I got this face mask along with JoJoba oil which I am supposed to include it in my night skincare routine.This osperi soothing oats face mask is in powder form and they are very smooth. There are granules but even the granules are smooth in texture. 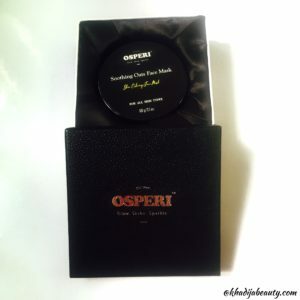 This osperi face mask has a mixed fragrance of perfume and oats and is light freen in color. I loved its smell and I am pretty sure you will like it too. 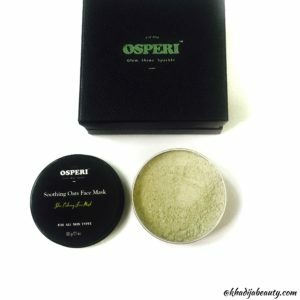 After using this Osperi face mask as a cleanser and as a face mask my skin felt super soft and silky. I am not kidding guys this seriously made my skin feel baby soft. This is suitable for all skin types. I have an oily skin and this literally removed all of my excess oil without leaving my skin dry. I usually moisturize my skin as soon as I cleanse my face but just to test this out I didn’t and to my surprise, I didn’t feel any sort of dryness even after not moisturizing it. I am not a big fan of powder cleanser because I am used to face wash and don’t feel comfortable using powder form of cleansers. But this Osperi face mask has given me enough reasons to use them. This is not at all harsh on the skin. I have a sensitive skin and it didn’t cause any breakouts instead it improves the skin texture. This Osperi Soothing Oats Face Mask cleanses the face, makes it super soft and smooth, improves the skin texture, removes excess oil without drying out the skin. The only thing which was missing is a small spoon or a spatula in order to make it convenient for us to take the right amount of product in a hygienic manner. But I have become a fan of this Osperi face mask and would highly suggest you guys try this. After washing my face I take 2-3 drops of Osperi Jojoba oil, rub them on my palm and then massage it all over my face. I have an oily to combination skin, so 2-3 drops of it are more than enough for me. But then if you have a dry skin you can obviously increase the quantity. I apply this 5-10 minutes before going to bed so that it is well absorbed into the skin. When it comes to hydrating my skin at night, I like to go overboard and that’s the reason why I use 2-3 drops of it. This oil provides a very good moisture throughout the night. Even if you use a little extra, your face will look oily but will not be sticky at all and that’s the reason I am loving it. Now you must be thinking wouldn’t it cause breakouts when it is used on an oily skin. Then the answer is no. This is completely natural and cold pressed oil. Most of the time all of the natural and cold pressed oils do not cause breakouts provided they suit you and your skin type. 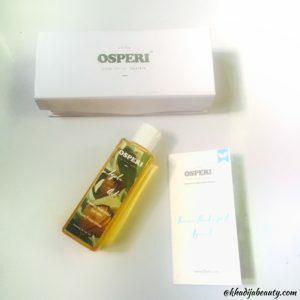 Osperi site would suggest right oil for your skin type as well. I used one drop of it as my day moisturizer also and this gave me a beautiful dewy look. You can also add it to your foundation to get a healthy glowy look. 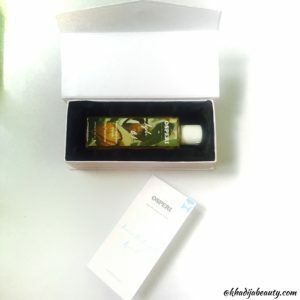 I prefer this at night as my face oil and I can tell that it keeps the skin supple and moisturized till next morning. This Osperi Jojoba oil is non-sticky, doesn’t break out and keeps the skin hydrated and supple throughout the night. If you are new to oils or want to try oil on the face then I would definitely suggest you try these. Take up the quiz on Osperi site and pick the right oil for your skin type. That is it guys for now. I hope you liked it. Do explore their site find out your skin and hair type. If you have any queries feel free to ask in the comments section below or mail me or DM me on Instagram. It’s a new brand to me. Wish to try that Oats mask. It sounds really good. thanx for introducing the brand! I shall definitely check it out! In love with packaging ? would love to try the Cleanser ? The packaging is great! ? Wanna try the face mask. Wow!!! Thanks for introducing me to this brand. The products seem quite promising. Looking forward to try few of these!! Nicely reviewed dear. ? Hearing about a new brand after really long time.